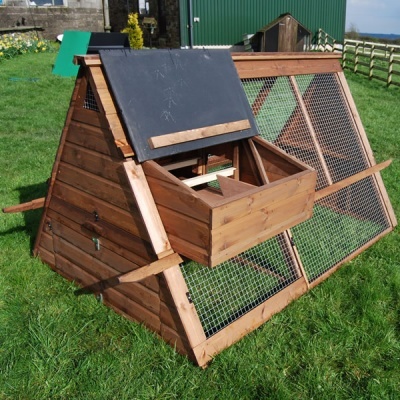 This top quality, traditional and British made chicken ark is constructed using 12mm tongue and grooved shiplap cladding fixed to 38mm square framing. All timber used in the ark is dip treated with long lasting wood preserver. 25mm square, 16 gauge weldmesh provides security against predators in the run section. An external nest box with two compartments provides roomy laying space. A hinged lid allows easy egg collection. A lift off panel gives access to the house. There is a hinged door to access the run area. The area under the house is weather protected on two aspects giving daytime shelter from wind and rain plus shade in the summer. 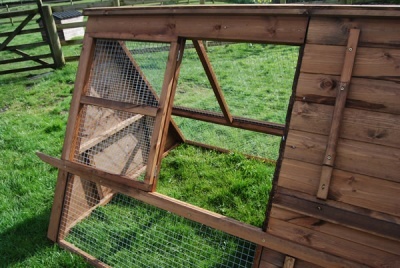 The side weather panel is removable and can be fitted left or right. 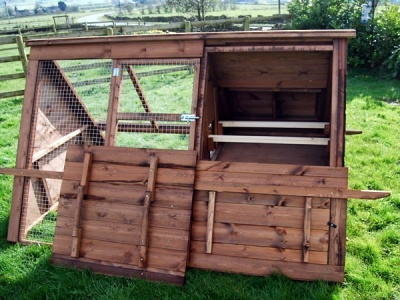 An additional weather panel is available to give extra protection. 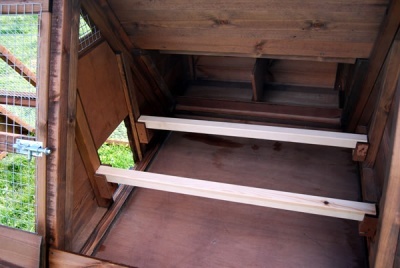 The end panel under the house rotates 180 degrees and is designed to take a feed hopper. This feature allows easy access / filling of hopper and weather protection when closed.